The purpose of our blog ‘Best Guitar Reviews’ is to share reviews and opinions about the most popular brands of guitars. We love guitars and as fans we wanted to create this space. The information we provide is purely educational and we are completely impartial. This is not a shopping site, but a place for impartial reviews about technical and musical aspects of various guitars. The information in this site is to help people choose the best guitar for their needs based on size, budget, playing style, and brand reputation. A good guitar from a reputable manufacturer is an investment and you should expect it to last. It can be really helpful to read the insights of others in relationship to particular guitars. Our reviews can help you make the best decisions and achieve the most from your valuable investment. Customer satisfaction is one of most important goals for this site. We created this blog to provide factual information to our readers. Unlike many other websites whose primary motive is only to gain visitor traffic, we are more engaged in providing relevant and verified information. Before posting reviews, we conduct detailed research using our unique research systems along with many years of experience. You will get quite a good education about guitars via the reviews and can go on to make the best decisions for your next and future guitar purchases. Hi! 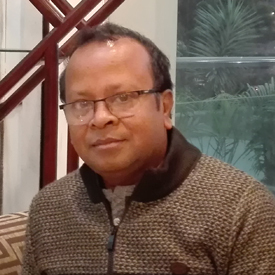 I’m Sumonta Haldar, the owner of this site, and I have a well respected family business called Haldar & Co which was established in 1910 and has been passed down to me. Apart from my passion for guitars I’m a graduate (and post graduate) from Intercollege, Cyprus and I am also a highly educated and successful businessman. I was born into a family of musical instrument manufacturers and merchants and since early childhood, have had a lifelong fascination and passion for guitars. At a very young age I started learning Spanish Guitar, and still love playing it when I have some spare time. This is also a reason why I’m extremely familiar with guitars of all makes and types. A truly accomplished musician understands that a bond between instrument and musician is vital to making beautiful music. To play music well goes beyond just the talent of the musician. A musician needs to have an instrument that is perfect for them, just like a beautiful painting depends upon a careful selection of brushes by the artist. In a sense a musician develops a deep emotional attachment to their instrument as it is the vessel that can express the music from the musician’s soul. A musician is incomplete until he bonds with his instrument. I was able to choose the best guitar for myself at such a young age because I had my elders who already knew so much, to guide me. They knew my potential and comfort. Being a guitarist and luthier, I am well acquainted with each and every part of a guitar. I have long standing expertise regarding the detailed specifications of every significant guitar brand. Every guitar has a perfect matching player. My passion is in matching the guitarist with the perfect guitar for them. Now that you’re here, I’m quite sure that you either want to know more about guitars or maybe you’re interested in buying one, probably online. Allow me to help you make the best choice as I have a wealth of information to share. My many years of guitar knowledge has come about through helping many novices in my shop who have trusted my expertise in assisting them find their perfect choice in guitars. Now I am able to pass this onto you!